By 1991, Deborah Wilson Gadsden already had 18 years of experience in the child welfare arena, all of it in Dauphin County Children & Youth Services. She had come from "an environment where I had to go into situations with people who were not my race, sometimes armed and angry, and didn't want a black woman telling them anything or knowing anything about their life," she said. Experience with the likes of drug addicts, prostitutes and people with HIV taught her that to get any kind of cooperation, "I needed to be able to empathize and accept many of their conditions without personal judgment." Gadsden, a training specialist with Family Design Resources Inc., shared this during her Jan. 18 keynote address at the 2017 SWAN/IL Winter Statewide Meeting in State College. The subject of her talk was disproportionality, specifically the over-representation of people of color in the child welfare system. In 1991, Gadsden took a new job with Lancaster County Children & Youth Services. She soon met Priscilla French, a 28-year-old mother living in a homeless shelter with her three young children. French was HIV-positive, had been picked up for prostitution, and abused drugs and alcohol. The shelter complained that she wasn't adequately supervising her children. "No caseworker at the agency wanted to work with her because they were afraid of her," Gadsden recalled. "They were afraid of her size, her skin color, and the way she spoke directly about what was on her mind. They made moral judgments on the way she made money, her use of drugs, her health condition and, because of how she spoke her mind, she was characterized as an aggressive, angry black woman." Carrying only her purse and a notepad, Gadsden approached French at the shelter. The first thing French said was, "Finally, a black caseworker." More important, Gadsden said French was confident she finally had a caseworker who would be an unbiased advocate for her. "I knew that only history would judge me," Gadsden said. She found a kinship resource for the children and got French to enter a drug treatment program. Although French ultimately died of a heroin overdose, the children were adopted and maintained a relationship with extended family. "We really did achieve the optimal outcome for everyone," Gadsden said. "I got equality, equity and social justice for the family." Too often, she suggested, that isn't the case. In Pennsylvania, African American children comprise 10.9 percent of the general population but more than 47 percent of children in care; Latinos are 5.9 percent of the population but nearly 14 percent of children in care. Whites are nearly 82 percent of the population but only 55 percent of children in care. "The research demonstrates the disproportionate representation of children of color in child welfare systems at all levels -- reports of alleged child maltreatment, investigations, and placement in out-of-home care," she said. "And it has been shown that children of color experience disparate treatment once involved in the system with longer stays, more placements, and different discharge patterns than their white peers regardless of age or gender." Yet, Gadsden said, national studies have found "no significant differences between races in terms of child abuse and neglect." A differing factor appears to be the fears, stereotypes and prejudices held by child welfare professionals. "A lack of cultural competence, even in well-meaning professionals, can prevent them from using effective engagement strategies with families from various cultural and language backgrounds," Gadsden said. The way a child welfare or juvenile justice institution responds tends to be influenced by the race or ethnicity of children, youth and families in need, she said. This leads to disproportional substantiation of cases of abuse and neglect -- and removals and placements -- for children of color. This effect can be seen at the youngest of ages in education: 42 percent of 3- and 4-year-olds suspended in day care and early childhood centers are black, while fewer than 50 percent of blacks graduate from high school. "And many African-American men," she said, "in turn, are virtually locked out of employment and are filling up the nation's prisons in disproportionate numbers." An unequal distribution of resources occurs in healthcare, too. "The people impacted most by this situation are children in foster care that we cannot find dentists willing to treat; foster children who must go to clinics for treatment in contrast to a private practice where they see the same doctor or group of doctors consistently; or children who must wait long periods of time for mental health treatment," Gadsden said. 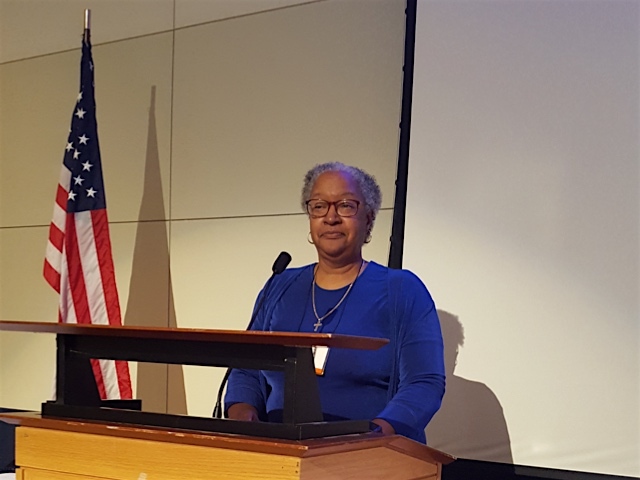 She discussed some of the steps being taken to address disparate treatment of people of color and disproportionality, from proposed federal legislation to studies of strategies for promoting racial equity in the child welfare system. "We are in the center of this work," Gadsden told her audience. "Each one of us has to make an individual commitment to face and address this issue if we want to be fair and equitable to our children and families."